The Winds Of Change Are Blowing In Opposite Directions! it seems that having analysed the pros and cons of Brexit the Foreign Affairs Committe of our elected Government would seem to reflect the view of the peoples of Britain; as 50% claim to favour BreXit & 50% oppose BreXit with the Chairman witholding his vote! That the Remain campaign, aka David Cameron & George Osborne and their direct followers, are not far ahead in this Referendum at this stage comes as no surprise to me, despite the fact that they have already abused their elected offices to try steal a march on those seeking to Leave-The-EU having spent a declared £9.3 Million of tax payers’ money on producing and distributing a leaflet to every home in the land – more than the Leave-The-EU campaigners are permitted to spend on the entire campaign! You will also note the vaste amount of OUR money they have spent on having The Treasury research and publish a 200 page report to the brief of showing the benefits of Remaining in the EU, having used countless opportunities to abuse their various offices by using those opportunities to promote the Remain cause, frequently based on outright lies and distortions of fact as Government Ministers! Then we have seen the unsightly genuflection of David Cameron and the Remain camp to Barak Obama who, as a lame duck outgoing American President, has spoken out to script, in support of The Remain Campaign and David Cameron’s spin – founded on little more than America’s direct interests or more to the point Barak Obama’s efforts to remain in some way relevant in the dog days of his Presidency! Then of course there are all the EU dignitaries who have spoken out in their oen interests to support Remain to try to keep Britain in the EU, yet at the same time contradicting, or if you preffer, telling the truth regarding David Cameron’s lies about his having achieved the reform of the EU and having obtained a special deal within the EU – a claim which no one in the EU of any stature would seem willing to endorse and many have directly contradicted. Despite the spin and lies from the Remain Campaign, who would seem to have thrown not just every resource they can muster but their very integrity at the peoples of Britain to dupe them with Fear Uncertainty and Doubt (FUD) – it would seem that they have failed to pull conclusively ahead in duping the peoples. That is not to say that the dishonesty of the Remain spin and its FUD will not, with a liberal dose of additional tax payers’ money up until the last minute backed with abuse of office and abuse of Government time and money they will ultimately fail, they may well actually dupe the people into a Remain vote, but do not for a moment that having cheated Remain will have solved the matter. The dishonesty of the oh so similar 1975 EU Referendum proved to be a running sore that has split the body politic in Britain and has been the biggest and most decisive issue in fracturing parties in the subsequent 41 years – so would it be if history repeats the outcome of a close Remain vote. This time however it seems likely that if the Leave-The-EU supporters are thwarted by this cheating and dishonesty, spin and FUD they will tend to seem to subsume themselves within the EU and within treacherous political parties that have betrayed and duped them – not with a view to ensure either the EU or the various parties are more successfull but to work to ensure they are split and ultimately broken to ensure Britain gains its freedom, restores its democracy, reinstates its borders, repatriates its sovereignty, reinforces our justice system, reinforces Westminster and recovers our independence to negotiate and trade with countries all round this planet – whether from the front, the middle or the back of that queue of self sufficient nations, no longer as vassals of an unelected undemocratic behemoth of foreign and very alien beaurocrats. You will see from the picture below that the winds of change are blowing and they give force to the two flags blowing them in very different, in fact opposite directions! 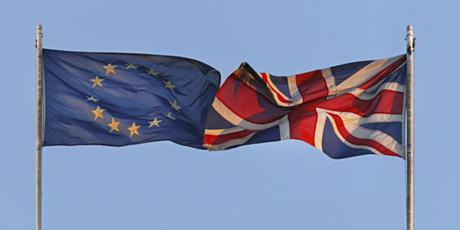 The Foreign Affairs Committee publishes report representing the full spectrum of opinion on the question of the UK’s continuing membership of the European Union. There are five members declared for ‘Leave’ and five for ‘Remain’. The Chair’s position is currently undeclared. However, all the members of the Committee have been struck by the desire from the public for an unbiased analysis. By producing a unanimous report, the Committee is able to meet this need. The objective of the report, is to inform the public before their decision on June 23rd. “In the country, there is a hunger for reliable, unbiased analysis for the issues that the electorate must confront when making their choice for Britain’s future on the 23rd June. I am delighted that the Committee has risen to the challenge of providing this analysis by agreeing a unanimous report. The referendum offers the British people a once-in-a-generation opportunity to chart a course for the UK’s role in the world. Voters should consider not only the short-term consequences of staying or leaving but the long-term opportunities and challenges. Previous Previous post: Barak Obama Further Damages The Special Relationship With Anti BreXit Meddling. Next Next post: Seeking To Avoid The Wars Of Disassociation With Penny Mordaunt!